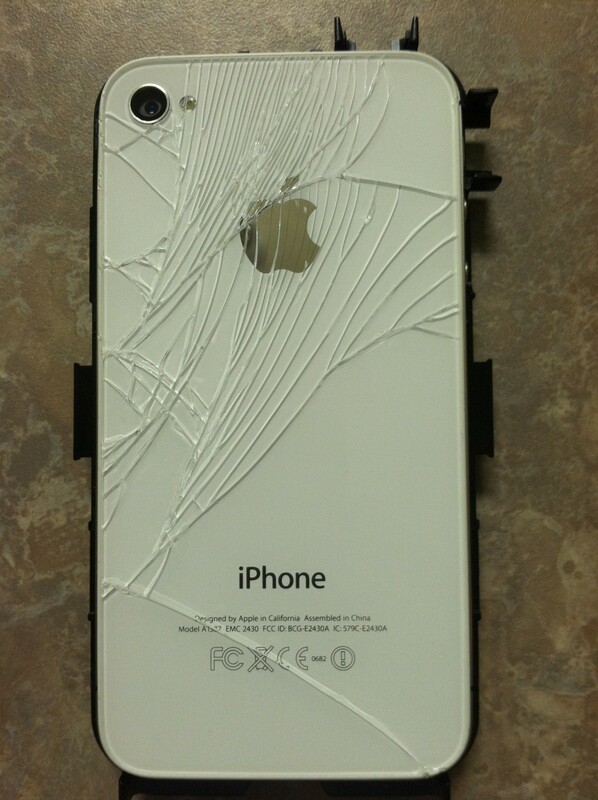 First of all, an update on my iPhone cracked glass drama. I’m so happy that USAA called me this morning to tell me that my computer/media insurance rider WILL cover the dropped phone, I’m to get an assessment from Apple about whether we can just replace the glass…which they will cover. If Apple says “No, replace the whole phone.” then USAA will cover replacing the whole phone! WOW! Now, before you all go running to USAA for computer/media riders, the adjuster made it clear that our policy is one of the LAST ONES to be worded such that it covers iPhones and by the end of 2012 ours will flip to exclude smart phones. The moral of the story? Get the Apple Care or your cell phone provider’s insurance for your phone. Now…back to the point of this post. 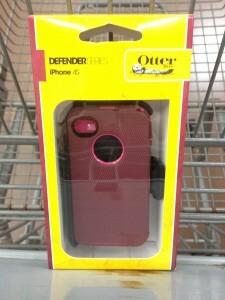 Today I went to Walmart to get an Otterbox case for my phone. I wasn’t very happy with the Griffin Survivor iPhone case so I exchanged it. The Otterbox costs more — it’s probably the most expensive case there is. But hey — now I don’t have to pay to fix my phone, right? My new Otter Box. The "Survivor" case I had before was a very bright pink, this one is more subdued. I like pink...in a subdued way. I also needed groceries. For the first time in a long time I wasn’t squeezing in a grocery trip among several other daily errands. I could take my time. I saw a lot of stuff but these two products caught my attention. "Whole Grain (Hamburger) Helper". 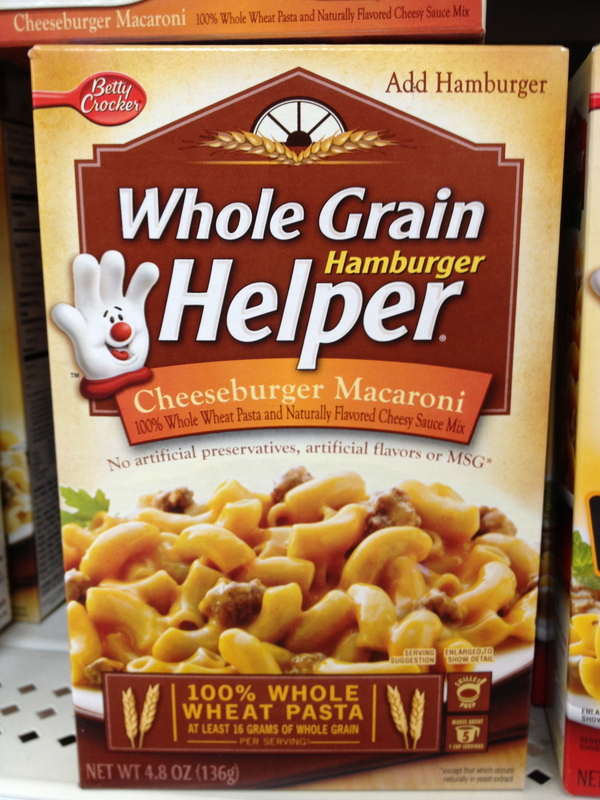 Plopped right next to regular Hamburger Helper. Many of you know about my adventures with Hamburger Helper in 2010. And my adventures with “homemade” Hamburger Helper afterwards. (Maybe it’s time to make the homemade version for the kids again, by the way). So I did some comparisons. I put Stroganoff-flavored Whole Grain Helper next to the Stroganoff-flavored regular Hamburger Helper to compare ingredients and nutrition facts. I don’t see a lot of difference…take a look and tell me what you think? The "Whole Grain" version is on the left, the standard is on the right. There's a little bit of calorie and sodium savings, but not enough for me to stop the presses and start buying it. Here’s the ingredient list. 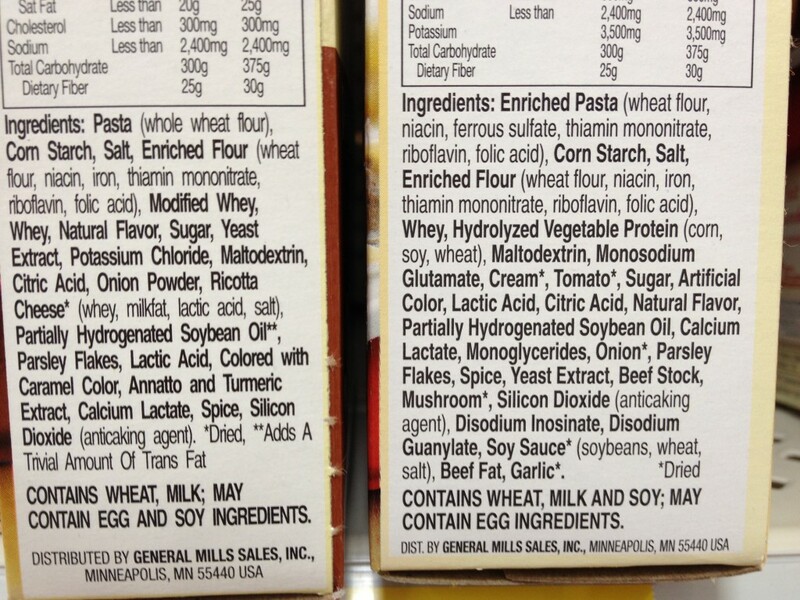 Again, a few of the more chemical-y ingredients — such as MSG — aren’t in the whole grain version, but I was surprised at how much was still in the whole grain version. 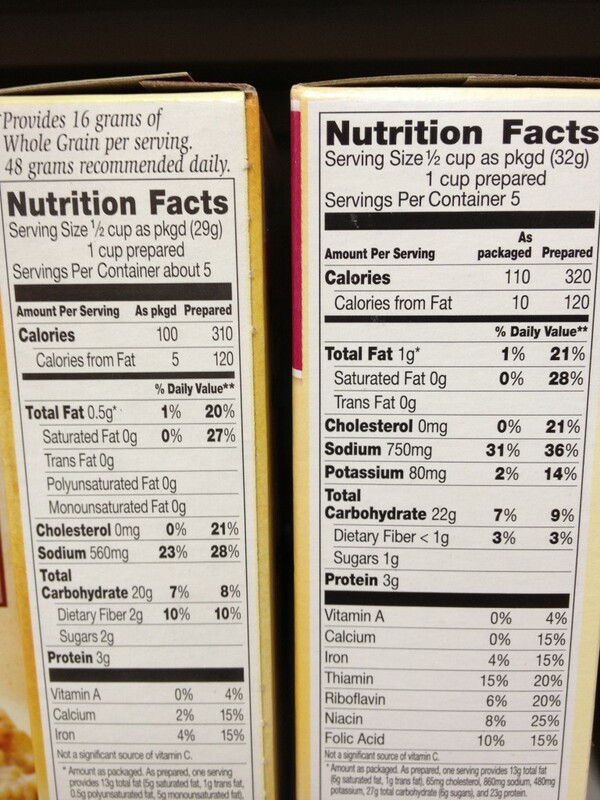 I’d have been happier if they had removed that partially hydrogenated soybean oil. Cue the John Williams theme! 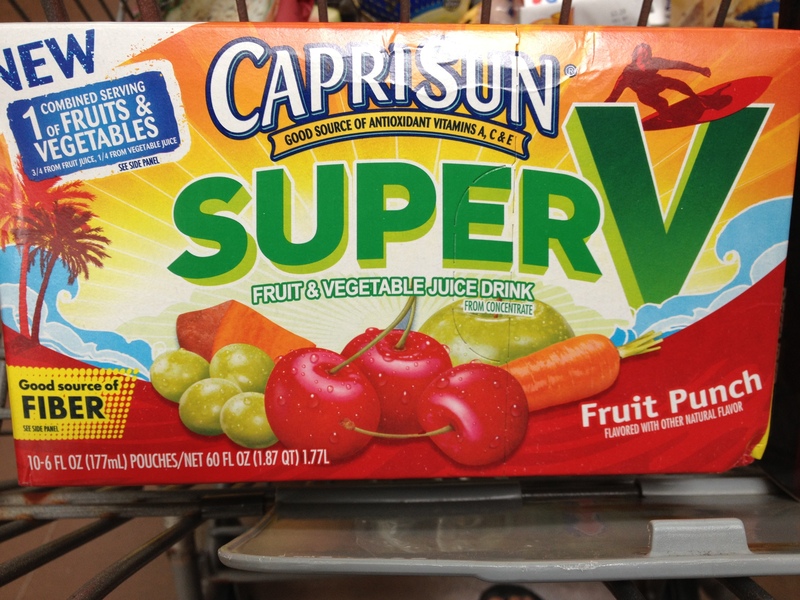 It's SUPER-V! With fiber, to boot! We buy V-8 Splash sometimes, especially the Light Concord Grape flavor. But I try really hard not to make a habit out of substituting fruit and vegetable juices for the real thing. So I decided to let the boys try these in their lunchboxes. We’ll let you know. PS: Does your school recycle Capri Sun pouches for Terracycle? Our boys’ schools do and it’s a great program. I’ve been promising myself a Capri Sun bag for a long time…maybe I need to actually do it? That’s how long have had my latest iPhone. I know, I dropped my original phone and had to deal with missing pixels for several months, then I dropped my 2nd iPhone into the toilet…and now this. On Saturday morning Jacob and I were preparing to run at our local Relay for Life event (which ended up canceled due to poor weather)…I was putting the phone into a velcro sleeve so I could start running. And it fell to the ground. It landed squarely on its back. Hence the dramatic cracking you see here. The good news is that the phone itself is still working perfectly fine. The phone, the GPS/location services, the camera, the motion sensors, leveling sensors, etc. It’s all good. Yay! I do NOT have AppleCare. I had assumed the computer and media rider on my property insurance would take care of this, but it probably won’t. While on Saturday I was pretty nervous about having to spend $750 on a new replacement for this phone, it probably won’t be quite that bad. The continued good news is that I can apparently bring the phone to an Apple Store and one can replace the back glass inexpensively. Anywhere from $29 to $100 based on assorted Apple support forums. But wait. I don’t live near an Apple Store! Never fear! 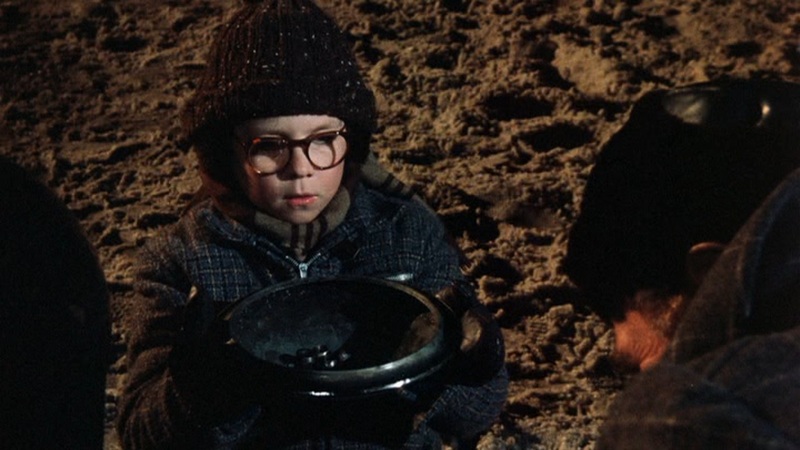 Next month I’ll be in Omaha and I think I’ll take my phone to the store out there and see what they can do. In the meantime, I got my hands on a pretty substantial case. In part because I’m really paranoid now, but also because I need to protect that cracked back panel — there are slivers of glass that can cut up my fingers, and Dave reminded me that I needed to protect the phone more now from that pervasive Florida moisture! Just a quickie this evening. Thursdays this month (and much of last month) have been very busy, between the boys each having baseball practice one after another. First Timmy has practice from 5:30-7:30pm, then Jacob’s is one field over from 7:30-8:30pm. It’s become a tradition — about 8-10 “little siblings” get together to play catch, tag, hide and seek, or some other classic game while the older brothers are practicing. It’s really cute. The Hipstamatic app is like Instagram — it filters your digital pictures to look old-school 🙂 It seemed to work out in this scene, so long as you don’t know what the kids are doing. The boys are watching the 2nd kid from the left play an iPhone app. 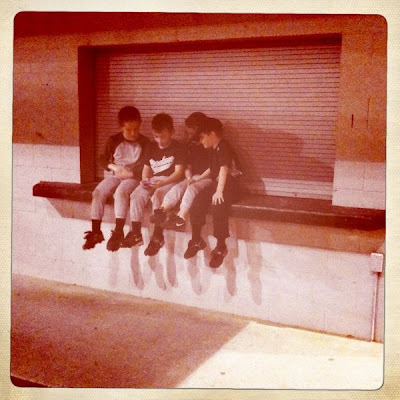 Three of the four of them (including Timmy) are on the same baseball team and they were all hanging out while their big brothers had baseball practice. I believe Timmy told me he was playing a game called Where’s My Water. 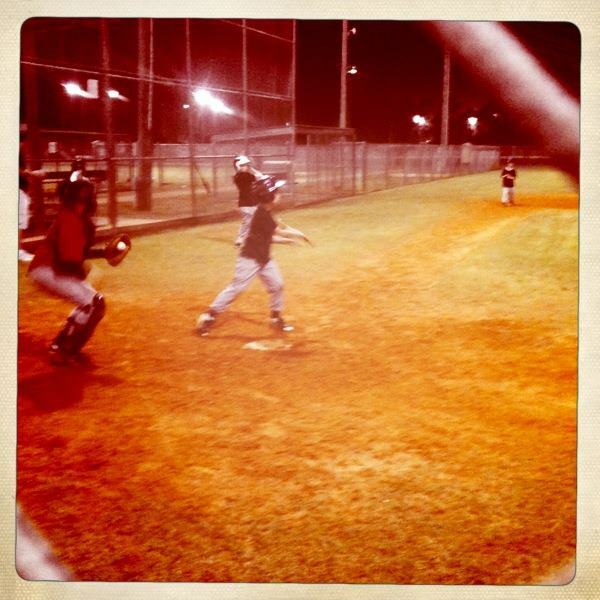 I tried to cram my iPhone lens through a fence link to get pictures of Jacob at bat, but it didn’t work so well. 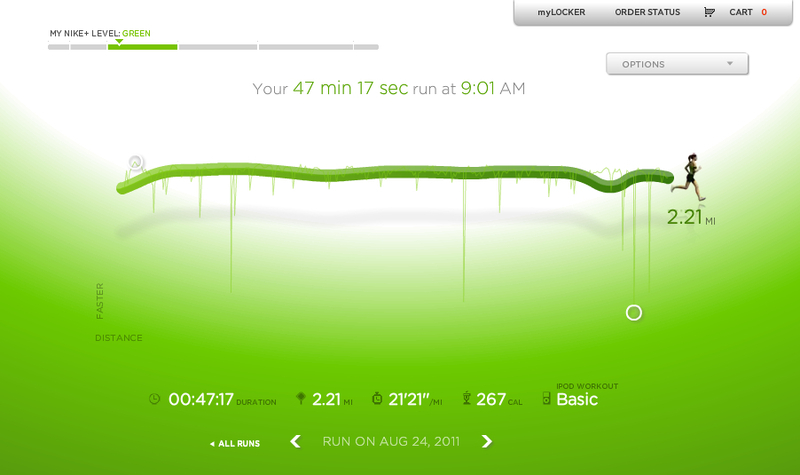 We’ll see how long this takes me…. 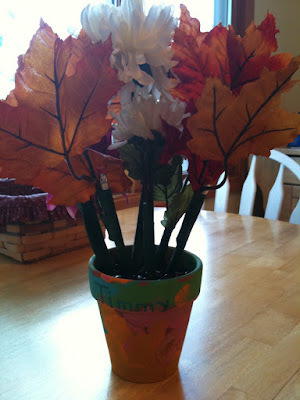 Timmy’s Flower Pot — Repurposed! I went to the Apple Store today and came out of there with a new replacement iPhone. Apple has a program where wet iPhones can be replaced for $199. This is FAR cheaper than walking into the store in the middle of a two-year contract and buying a new phone: $500. But far more expensive than if I hadn’t dropped the phone into the toilet to begin with. Timmy came across an empty flower pot in our garage, where I’ve stored all of our flowerpots. It was one that he made for me at preschool in 2009 for Mother’s Day. It had a potted petunia in it. Once the petunia finished up for the season, I put away the flowerpot. You’ve all seen them at the doctor’s office or anywhere else where you’re having to sign paperwork and they’re attempting for you to not steal pens. The flower pot full of pens. So that’s what I did this morning. 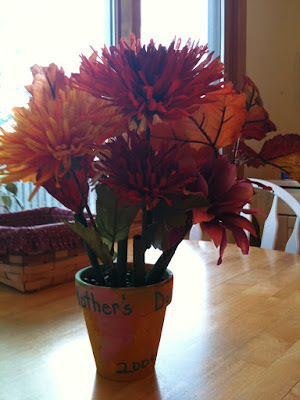 I ran over to Michael’s and picked up a few fall-inspired flowers and some floral binding tape. I had everything else I needed in the house: the pot, the beans as filler for the pot, and plenty of pens and pencils. I whipped this together in under 10 minutes. Cute, isn’t it? Timmy was thrilled to see this come to life, and is happy his flowerpot is now a centerpiece at the kitchen table. And maybe now I won’t leave a trail of pens and pencils all over the house. iPhone and Potties Don’t Mix! Right after I hit “Publish Post” on that Labor Day blog post below, something dreadful happened. I got up from my spot on the couch where I do my blogging, walked to the half bath just outside the family room, and prepared to go to the bathroom. Before I could get started (thankfully!) my iPhone fell out of the front pocket of my shorts and I heard the “Plop!”. As quickly as humanly possible, I fished my phone out of the bowl, wiped it with a towel and ran back to the laptop by the couch to Google “wet iphone”. Mostly blog posts about (a) how to dry off a wet iPhone and (b) how to scam the Apple Store into pretending your phone didn’t get wet to get a free replacement. The phone was still on while I was reading all this…but the screen had become VERY dark. Not off, but really dark. I tried to make a phone call, but the phone was indicating that the SIM card was missing. Quick! Remove the SIM card! I found my can of compressed air and blasted some of the moisture out of the bottom port, the top headphones and SIM port and around the home button. The next step was to store the phone in a container filled with uncooked rice. Just immerse the phone into the rice. You have to be disciplined to not turn on the phone (and risk shorting out the circuits) and let the rice do its work drawing the moisture out of the interior of the phone. UPDATE: The phone has been sitting in the rice for 9 hours. I misbehaved and turned on the phone just now and Dave and I made a test call. It all seemed to work. Whoo hoo, right? No…the home button still doesn’t work. In order to attempt another App, I had to power off the phone, then power it back on to return to the home screen. Then I could check out the iPod feature (which worked) and a couple of the apps. It’s back in the rice for the night. It has 12 more hours before I have to decide on attempting to replace it altogether. Just showing off one of the gizmo gadgets I’m trying out here. This software is in my iPhone. 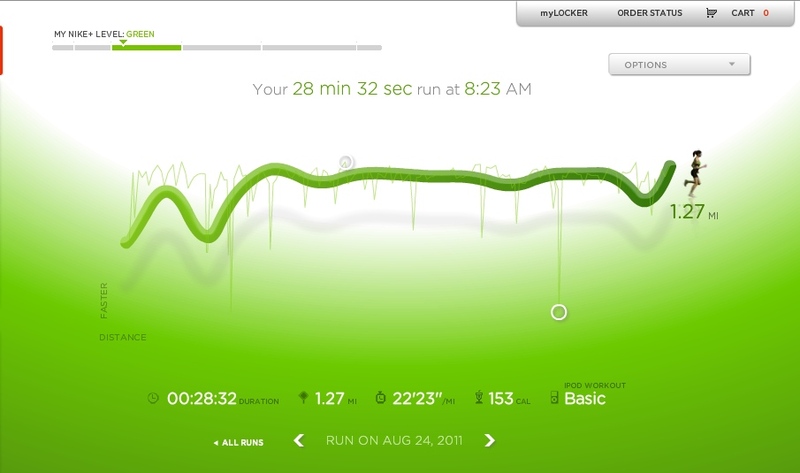 It ties into the GPS in the phone and records location, distance, speed and time. I’ve downloaded the free version, which has some sort of screen saver glitch that prevents me from stopping the runs in time, so it isn’t 100% accurate, but it’s good enough for me. In fact, in this case, the GPS didn’t kick on until I was about 6 houses down from where I started running, so this route is about .1 miles short. For more oohs…and aaahhhhs….click on “Show Elevation” towards the bottom. This is one of the hillier runs I do, and my knees usually pay me back for about 24 hours after this run. Anyway, this guy (a pilot, actually) showed me how to fine tune the settings on the phone so that my data tranissions never ride on the local cell phone network here. So if I’m kicked off the wireless here, I won’t get charged for data transmissions on the Q-Tel network. Since I have my phone with me all the time as my music, this makes it much easier than lugging my laptop to the Bra area everytime I might have a hankering to get on Blogger or Facebook. In other good news, my laptop batteries arrived today and they seem to be in good working order. They’re charging as we speak. I’m so glad I won’t be tethered to these outlets so much now. My final note: went to the base theater to see “Nights in Rodanthe”. It’s okay. Sadder than I thought, but definitely not “Marley and Me”. I guess I should read the Nicholas Sparks book (I think that’s who authored it). The scenery (story is set on the NC Outer Banks) is stunning and I started missing the beaches of North Carolina, where our family spent quite a bit of time when Dave was in school. I’ve read a couple of his books and have enjoyed them.